Hark! Important day coming concerning all cats. Well sometimes dogs enjoy it as well. This is the day where any cats worth their saltines, get to glory in their favorite activity: hanging out in boxes. Big boxes, round boxes, flat boxes, tall boxes, no box is unimportant to us. So fair warning! It's not too early to look for those boxes and cartons you did/didn't want...and give them to your cats. Or dogs. Or to US! 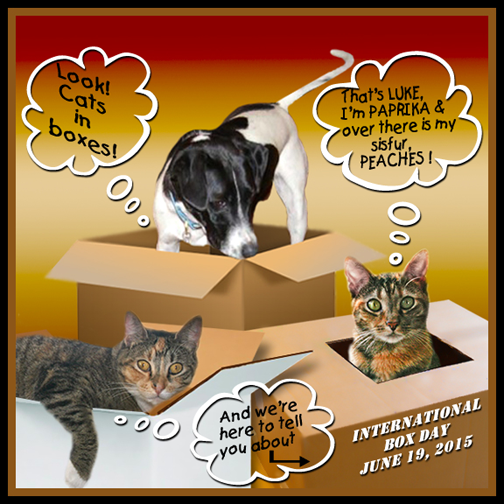 Gather box photos now for that great event...ze internationale Box Day on June 19. You heard it here. Boxes are wunnerful to US! We love boxes and boxing day. We are looking forward to that day. You two suire look good in your boxes. You all have a wonderful day. Thank you for reminding us of this very impawtant day. We love a good box too! Thanks for the reminder. It’s one of my fave days of the year. for hostin box day...we will ask de food serviss gurl if we can play along....guess we better get a nice lookin box huh....coz R litter box iz in kinda sad shape !!! ☺☺ pleez feel free ta stop bye trout towne any time...we all wayz haz foodz on de grill...28.8.367 !! Oh! Box Day is my favorite day of the year!! !